A Saratoga Springs NY golf vacation isn't just about golf! Of course, you do have your choice of a dozen excellent golf courses to play within 10 miles of Saratoga, including Saratoga National Golf Club and Airway Meadows. Then there's always the option to improve your swing by taking some private lessons from any of the area's many notable golf pros. Add to that the chance to enjoy first-class facilities: great pro shops, excellent restaurants, and beautiful fairwaysÃ¯Â¿Â½what else is there? After experiencing the best in Saratoga Springs golf, vacation fun in the rest of the Spa City is wide open for exploration! Test the Spa City's excellent reputation for superb ethnic and eclectic dining. Spend some time exploring historic Saratoga National Historic Park where the early history of our country was formed. Do a little shopping, and browse the cozy shops, boutiques and bookstores lining the main street for one-of-a-kind treasures. Treat yourself and discover the mystery of the relaxing, legendary mineral baths and spas. Lodging choices range from stately and elegant Victorian bed and breakfasts and inns, to hotels, motels, and campgrounds. The arts are well represented here, so your Saratoga Springs golf vacation may also include tickets to great shows, concerts, ballet, or museums and galleries. A full round of golf at any one of the many award-winning championship golf courses followed by a day enjoying the Spa City will prepare you for a restful or rousing evening...whichever you choose. As the sun sets, Saratoga nightlife emerges with a full choice of social diversions. Wind down with dinner and a movie or, if you feel like kicking up your heels, dancing, entertainment, and music provide a festive end to a satisfying day of golf, great Saratoga dining and fun. From the moment you tee off until the time you return to your elegant Saratoga lodging, you'll find everything you need to savor every moment right here. 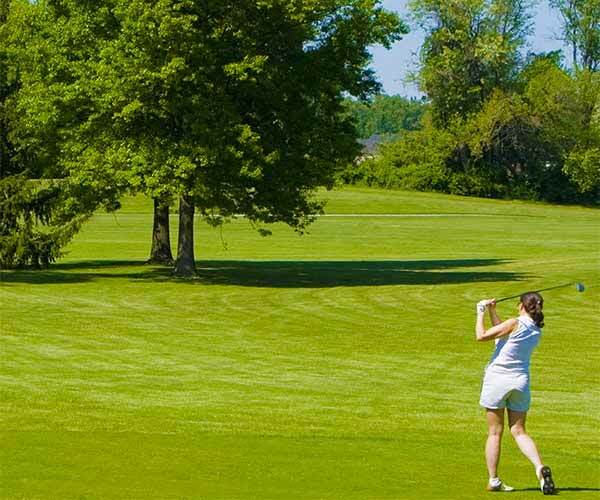 No matter what your plans may include for a great Saratoga Springs golf vacation, you'll be sure to find it!